The Cross-Cultural Relationship is the idea that people from different cultures can have relationships that acknowledge, respect and begin to understand each others diverse lives. People with different backgrounds can help each other see possibilities that they never thought were there because of limitations, or cultural proscriptions, posed by their own traditions. Traditional practices in certain cultures can restrict opportunity because they are “wrong” according to one specific culture. Becoming aware of these new possibilities will ultimately change the people that are exposed to the new ideas. This cross-cultural relationship provides hope that new opportunities will be discovered but at the same time it is threatening. The threat is that once the relationship occurs, one can no longer claim that any single culture is the absolute truth. Cultural relativism is the ability to understand a culture on its own terms and not to make judgments using the standards of one’s own culture. The goal of this is promote understanding of cultural practices that are not typically part of one’s own culture. Using the perspective of cultural relativism leads to the view that no one culture is superior than another culture when compared to systems of morality, law, politics, etc. It is a concept that cultural norms and values derive their meaning within a specific social context. This is also based on the idea that there is no absolute standard of good or evil, therefore every decision and judgment of what is right and wrong is individually decided in each society. The concept of cultural relativism also means that any opinion on ethics is subject to the perspective of each person within their particular culture. Overall, there is no right or wrong ethical system. In a holistic understanding of the term cultural relativism, it tries to promote the understanding of cultural practices that are unfamiliar to other cultures such as eating insects, genocides or genital cutting. There are two different categories of cultural relativism: Absolute: Everything that happens within a culture must and should not be questioned by outsiders. The extreme example of absolute cultural relativism would be the Nazi party’s point of view justifying the Holocaust. Critical: Creates questions about cultural practices in terms of who is accepting them and why. Critical cultural relativism also recognizes power relationships. Absolute cultural relativism is displayed in many cultures, especially Africa, that practice female genital cutting. This procedure refers to the partial or total removal of the external female genitalia or any other trauma to the female reproductive/genital organs. By allowing this procedure to happen, females are considered women and then are able to be married. FGC is practiced mainly because of culture, religion and tradition. Outside cultures such as the United States look down upon FGC, but are unable to stop this practice from happening because it is protected by its culture. Cultural relativism can be seen with the Chinese culture and their process of feet binding. Foot binding was to stop the growth of the foot and make them smaller. The process often began between four and seven years old. A ten foot bandage would be wrapped around the foot forcing the toes to go under the foot. It caused the big toe to be closer to the heel causing the foot to bow.In China, small feet were seen as beautiful and a symbol of status. The women wanted their feet to be “three-inch golden lotuses”三寸金蓮 It was also the only way to marry into money. 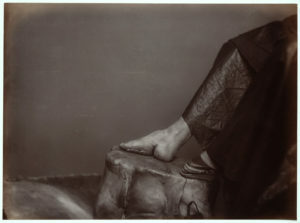 Because men only wanted women with small feet, even after this practice was banned in 1912, women still continued to do it. To Western cultures the idea of feet binding might seems torturous, but for the Chinese culture it was a symbol of beauty that has been ingrained the culture for hundreds of years. The idea of beauty differs from culture to culture. ^ Schultz, Emily A., and Robert H. Lavenda. Cultural Anthropology : A Perspective on the Human Condition. New York: Oxford UP, Incorporated, 2009. pg.79.